Civitas: Institute for the Study of Civil Society Inspection, Inspection, Inspection! Since 2003 Ofsted has been tasked with inspecting many independent schools. Although private schools are theoretically free to devise their own curriculum and teaching methods, Ofsted can and does pressure these schools into conforming to a standardised template. 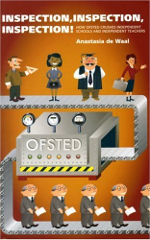 Looking into the way independent schools inspected by Ofsted are penalised for operating outside the Ofsted box, Inspection, Inspection, Inspection exposes the inspectorate’s inability to truly gauge quality and the perverse resultant consequences, from fabricated paper trails to in some cases a lowering of the standard of provision.